Jennifer Bridges, PMP, in this short tutorial video, goes deeper into the skill sets needed to plan for your project’s success. By applying these points to your project plan you’re able to better foresee the course of your project and have prepared for inevitable roadblocks sure to come up along the way that are now maneuverable rather than disastrous. Pro-Tip: No matter the level of your experience, you can benefit from going back to planning basics. That’s why, even when in the advanced stages of your project plan, it doesn’t hurt to remember the fundamentals, which are outlined in How to Plan Better Projects.Thanks for watching! 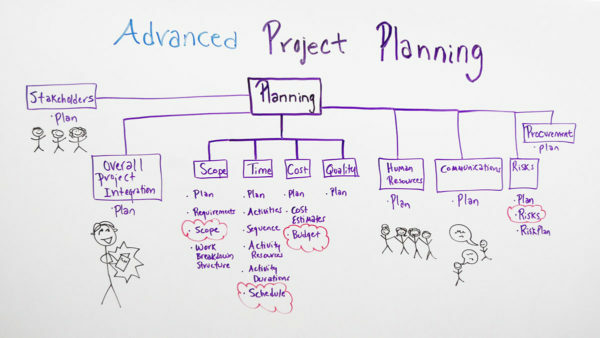 Today we’re talking about advanced project planning. There is so much to talk about in the area of planning, but today I want to focus on the planning activities and 10 areas to focus on during your planning.First of all, there’s stakeholders. There are stakeholders of the project, so you have to build a plan on how to manage those stakeholders. Within the plan, you identify who the stakeholders are, what areas of responsibilities they are representing, and their priorities and how to manage those stakeholders. There’s also the overall project integration. And what that focuses on is the entire project, and how to integrate all of the pieces together.The other area is scope. You build part of the plan on how to manage and track your scope. And also, here you identify what the scope requirements are. Again, here you identify the scope, and you build your work breakdown structure. For the time, you build a plan to manage and track the time of the project. You identify all the activities required to actually deliver this project. You sequence those activities with dependencies and priorities. You identify the resources required to handle those activities. You determine the duration of those activities. And ultimately, you build your schedule. For the cost of the project, you have a plan to identify, and manage and track your cost. Here you determine your cost estimates for the activities, and you build your budget. And then you also have a quality management plan. You identify the requirements of quality required for your project, and how to manage those. The scope, the time, the cost and the quality you may have heard by some people called, “the triple constraint” as identified by PMI, the Project Management Institute, but there are even more components to managing your plan. It’s the human resources. So in human resources, you build a segment of the plan to identify what human capital, what people are required for your project, what skills they need, and how you’re going to go about getting those people or human resources for you project. Also included is your communications plan. A communication plan identifies the people on your project that need to know information. It identifies what information do they need, when do they need it, and how do they need it. Communications is where so many projects fail. It’s an area where a project manager needs to spend a lot of time in that planning. The next is the risk plan. The risk plan is a plan to identify your risk, and qualify them and quantify them, build a risk mitigation plan to say how you’re going to mitigate those risks if they occur on your project.The last one is your procurement plan. And the procurement plan identifies how you go about procuring your human resources, and other resources on your project. So as you can see, there are a lot of elements to plan on a project.